Qipipłuu, ililgaaqłuu, qipiragałuu grass-sak malguk, like qipsraq. Taimana makua piliagurut. (Twist it, after you put it, twisting two strands of grass at a time, like [twisting] sinew. They are made that way.) You have to wet the grasses first, so they won’t break easily. 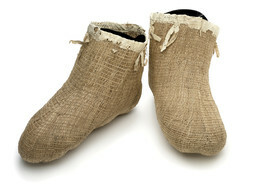 Woven grass socks were worn inside skin boots to have warm, dry feet. Additional layers of insulation could be added, such as fur socks, wool socks, and bottom pads of folded grass. At night, socks and boot pads were hung by the oil lamp to dry. Anna Etageak: I never did see grass socks. Theresa Nanouk: But you folks used them as insoles inside of the boots. Oscar Koutchak: Gee, look at that work. Anna Etageak: Qipipłuu, qipiragałuu grass-sak malguk [twist it, twisting two strands of grass at a time], like qipsraq [sinew (thread)]. Taimana makua piliagurut [they are made that way]. You have to wet the grasses first, so they won’t break easily. Frances Charles: Yes, that’s really thin skin. It must be sealskin or reindeer skin. That’s more like reindeer skin. Frances Charles: So what did they call these? Oscar Koutchak: Piniġluk, yeah. Remember gunnysacks? When we had no sock long ago, we took a gunnysack and cut it about like that [rectangle], and we wrapped our feet with it. Socks, nice and warm. Frances Charles: Mom used to rip gunnysacks and make socks. 1. For an explanation of winter tanned skin, see “making skin white” section in discussion of boots E038771.